To keep the model simple and take advantage of the symmetry of a balloon, we can build a 2D axisymmetric geometry that consists of only a rectangle and an ellipse, together with slightly larger double versions to account for the rubber balloon. Our goal is to see what happens if we let the same amount of water into different-sized balloons. To do so, we can parameterize the geometry and use a scaling factor to change the initial size of the balloon, while the material thickness and the neck radius remain constant. Geometry of two deflated water balloons of different sizes. The size is controlled by the stretching factor fact: fact = 1 (left) and fact = 2 (right). The water balloon model makes use of new features in version 5.3a of COMSOL Multiphysics, including improved fluid-structure interaction (FSI) functionality and a realigned moving mesh. As of COMSOL Multiphysics version 5.3a, FSI is modeled via a Multiphysics node. The node connects the physics from Fluid Mechanics and Structural Mechanics interfaces. In contrast to earlier versions of the software, where there was a separate Fluid-Structure Interaction interface, we can now use all of the available features from the two-way coupled physics. The interfaces and the moving mesh after adding the FSI physics. In this example, it is easy to take gravity into account. All we need to do is place a checkmark in the Laminar Flow interface settings. This activates the gravity of the earth, which in turn has an effect on the mechanical behavior due to the hydrostatic pressure in the water. We can expect that there will be a noticeable effect of gravity on the results, and this effect will be more significant in the larger water balloon, because there is more mass in the beginning. On the mechanical side, the physics settings can likewise be set up quickly. We only have to define a suitable material model that describes the hyperelastic properties of the material of the balloon correctly. In the Application Library, the Inflation of a Spherical Rubber Balloon model contains a variety of hyperelastic materials. We can use the Ogden model here, because it reproduces the analytical solution most accurately. 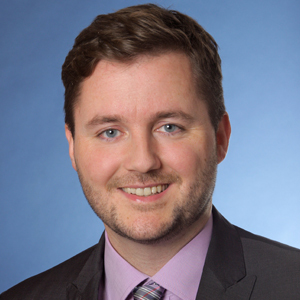 Interested in details about fitting measured data to different hyperelastic material models? Check out this previous blog post. By the way, copying model interfaces between different models is now very simple. 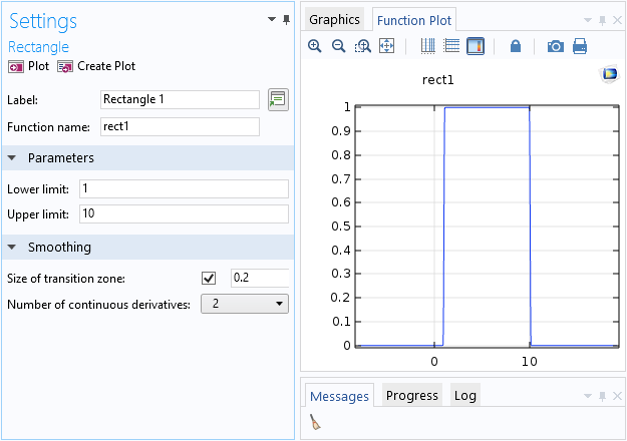 Since version 5.3a of the COMSOL® software, interfaces and components can be exchanged via the copy-paste functionality — even between two running COMSOL Multiphysics® simulations! This means that we can efficiently insert material settings from another model into the water balloon model. Parameters of the hyperelastic Ogden material model used for the balloon. 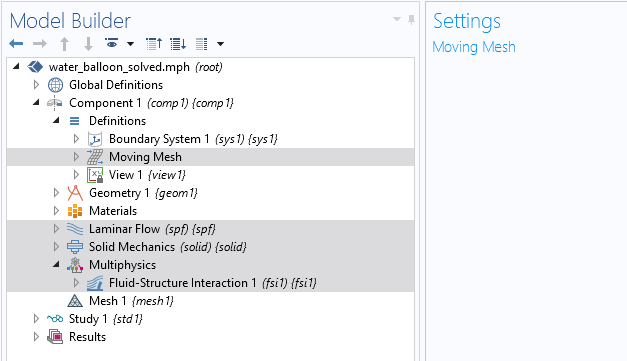 Another improvement in COMSOL Multiphysics version 5.3a is the new positioning of the Moving Mesh interface. It is now found at a more prominent position under Definitions. One advantage of the new structure is that it helps avoid accidental overlaps between deforming and nondeforming areas. For the water balloon model, this improvement means that we have only two tasks for the mesh: selecting the balloon’s interior water as a Deforming Domain and adding a Prescribed Normal Mesh Displacement on the symmetry axis (to avoid unwanted movement away from this axis due to numerical inaccuracies). The final step before solving the water balloon model is to set the water flow timing. Turning the tap on and off quickly with a defined amount of time in between can be expressed by a rectangle function. This function is multiplied to the inlet velocity of 15 cm/s, creating a flow of about 1.4 l/min. The water inlet velocity is controlled via a rectangle function. We can carry out a parametric sweep study to compare the simulation results for three different initial balloon sizes. All three balloons are filled with the same amount of water because the inlet velocity and the filling time period are the same. By far, the largest stress occurs in the smallest balloon. This is as expected, because the small balloon has the smallest surface and the largest relative volume increase. These results call for some animations! If we take a look at the transitional behavior of the inflation, we clearly see the influence of gravity on the largest balloon, because it oscillates before the water injection even starts. There is no prestress in the balloon, so it starts falling down a bit until the counterforce from the material is large enough to compensate for the gravity. Animation of the von Mises stress in the smallest water balloon during inflation. 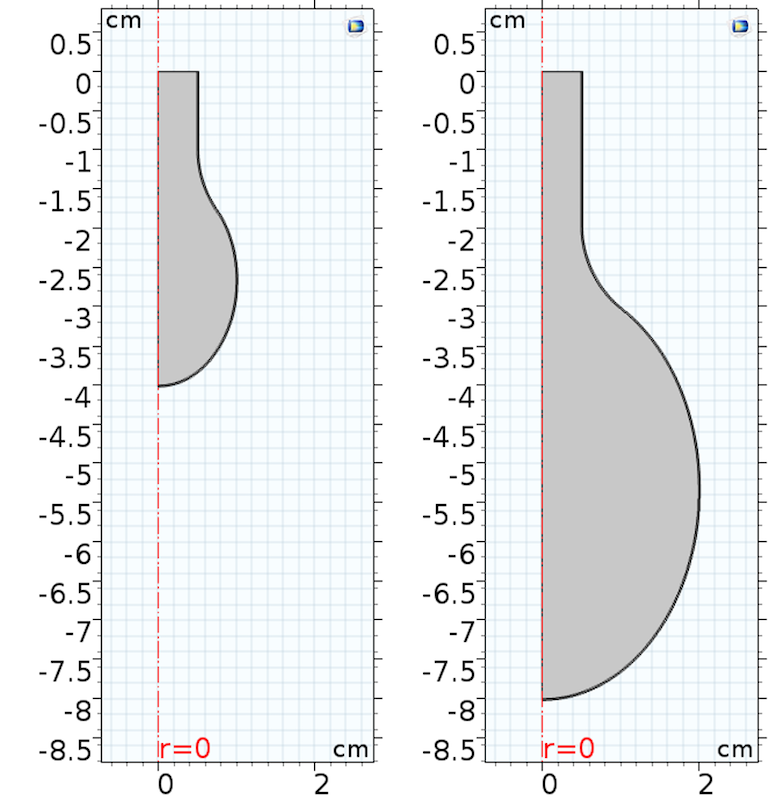 Animation of the von Mises stress in the medium-sized water balloon during inflation. Animation of the von Mises stress in the largest water balloon during inflation. 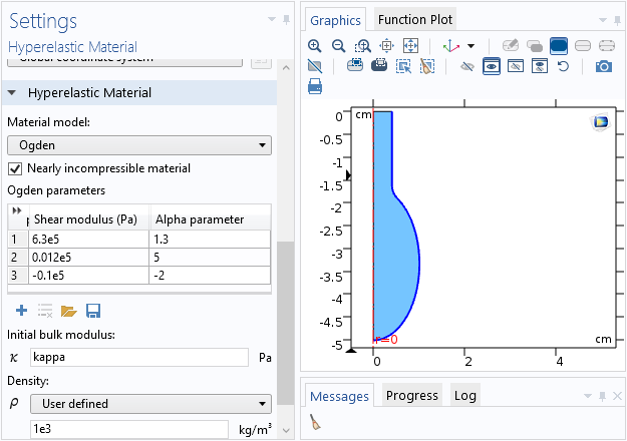 The FSI functionality in COMSOL Multiphysics version 5.3a includes useful enhancements and is more user friendly than in previous software versions. With surprisingly little effort, it’s possible to set up a complex FSI model and solve it in a short time. I am very curious to see how you use these new features to master your modeling challenges!